We’re heading back to the Clone Wars. Let’s now check out the Yoda/Clone Trooper Commander Value Packs set! It’s the focus of our Research Droids Reviews today! Be sure to leave your thoughts in our comments section, vote in the poll or comment about it on our Facebook page. Click the banner below for the direct link to the review! As always, you can also send your review requests via email if you’d like to see something that we didn’t cover yet. ← Vintage Collection Target Exclusive Han (Stormtrooper Disguise) FOUND! 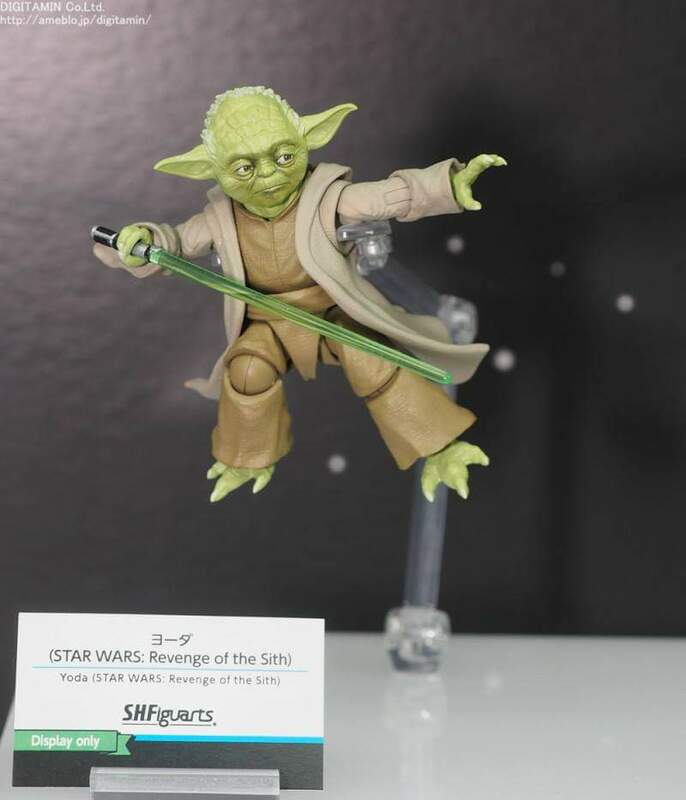 SH Figuarts Yoda Up For Pre-Order! SH Figuarts will release Yoda, based on his look in Revenge of the Sith, in late August 2019. Pre-orders are up already on some of the Japanese websites, others will follow shortly. 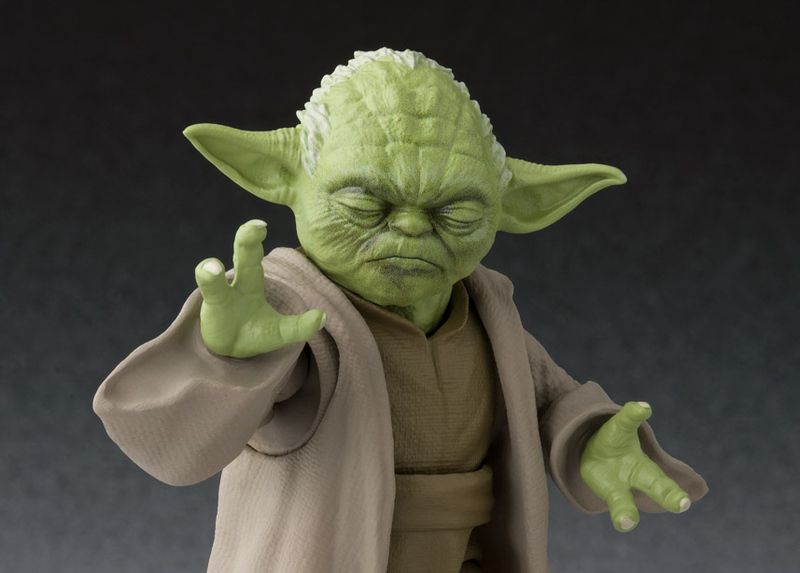 Yoda is a web exclusive figure, which means he’s somewhat more expensive than a regular release and that aftermarket prices for him will be very high. Other SHF web exclusive Star Wars figures go for more than $200. So anyone who wants a prequel Yoda should absolutely pre-order. You have to pay in advance, however. There is a pre-order period of 3 months. Once pre-orders close you are out of luck and you have to resort to the aftermarket. Yoda will come with three headsculpts, three cloak pieces, his Jedi council chair, his cane and his lightsaber. Click through for more pictures! ← What Will The Next HasLab Item Be? 6" Is Likely The Focus This Time! We’ve updated wave 3 from the red-carded The Power of the Force line with all-new Visual Guides. Click below to check out each figure from this wave. Make sure to also check out each review for this wave in our Research Droids Reviews database, where you can also join in on comments for each figure. 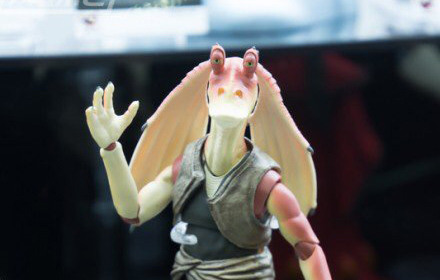 SHF showed a few all new Star Wars figures at the Tokyo Comic Con. And they also showed some things we had glimpsed before. Fans of the Japanese Star Wars line have many things to look forward to, when and if SHF ever decides to officially announce the figures! Click through for quite a few photos from the show! And thanks to Matthew C. for the alert! ← How Would Trade Tariffs Affect Star Wars Toys? 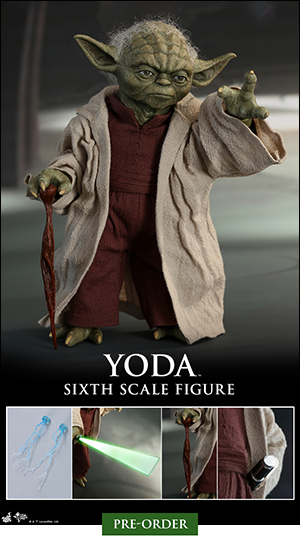 Sideshow Collectibles has put up for pre-order the Iron Studios 1/4 Scale Yoda Statue. This statue has a very impressive environmental display base. Click here for the pre-order page and full gallery! By popular request, we’re adding The Original Trilogy Collection Jedi High Council Scene Packs which were all Toys R Us exclusives from 2004. Let’s start off with Jedi High Council (Featuring Qui-Gon Jinn, Ki-Adi-Mundi & Yoda) (Scene 1). It’s the focus of our Research Droids Reviews today! Be sure to leave your thoughts in our comments section, vote in the poll or even comment about it on our Facebook page. Click the banner below for the direct link to the review! As always, you can also send your review requests via email if you’d like to see something that we didn’t cover yet. ← A Ton Of New Gamorrean Guard Store Reports! "Some Like It Hoth" Complete! Kenner Series 4 Next! Our “Some Like It Hoth” marathon of the Star Wars Series 3 Vintage Kenner Mini Action Figures has concluded. If you need to catch up on any of them, all you need to do is click any thumbnail below, and it will take you to the archive. We’d once again like to thank you for your participation. Recounting all of your childhood memories with these unequaled action figures and sharing the wonderful experiences you’ve all had with them is priceless. Please keep adding to the discussions! Also, please begin to prepare yourselves for more as we dive into August’s “You Bespin Me Round (Like A Record)” marathon where we look at the Series 4 figures. These reviews will focus on the Kenner action figures from the second wave of The Empire Strikes Back line. Our “Some Like It Hoth” run of vintage Kenner reviews (the Series 3 figures) concludes with the stunning Yoda figure. And Yoda still looks fantastic today. Relive your memories of this classic 1980 action figure in our Research Droids Reviews today. Be sure to add your own experiences to the conversation! Reminisce your own childhood stories of this figure in our comments. Share your life-changing vintage Kenner adolescent experiences with us! Sideshow Collectibles is releasing a second version of their Yoda Sixth Scale figure, this one being just different enough to be… different. This version doesn’t include quite as many accessories as the original release, and the portrait is slightly different as well. If you missed out on the first version then you get another chance at this slightly newer version. Click here for the pre-order page and additional images. 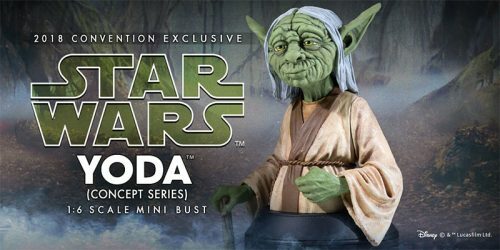 Gentle Giant is continuing their tradition of SDCC exclusive McQuarrie Concept mini busts, with this year’s release to be Yoda. Click here for the product page (note: you may need to be logged in to see the product page). ← Rank The Star Wars Movies, Now With Solo! Let’s continue to go back in time and check out some figures from The [Post] Original Trilogy Collection. Next up is Yoda (Dagobah Training) (’05 #16) figure. It’s just a repack, but find out more in our Research Droids Reviews today! Be sure to leave your thoughts in our comments section, vote in the poll or even comment about it on our Facebook page. Click the banner below for the direct link to the review! As always, you can also send your review requests via email if you’d like to see something that we didn’t cover yet. 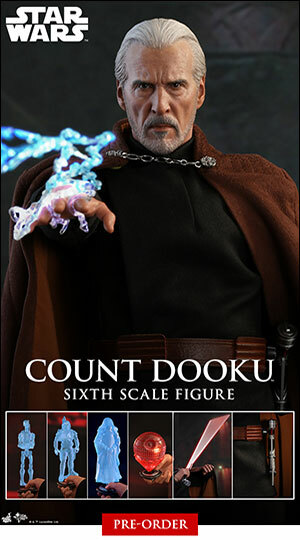 New SH Figuarts Star Wars Figures Teased! SH Figuarts will for the first time show The Last Jedi Luke Skywalker (Crait) and a Revenge of the Sith Yoda at the Tamashii Comic-Con this weekend! So it seems SHF will beat Hasbro to the punch once more when it comes to making a TLJ version of Luke! 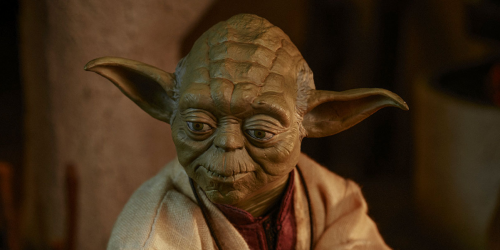 But I am especially excited for Yoda, since the Hasbro version may have a good sculpt, but it’s too tall and the facial paint apps leave much to be desired! We will post photos once they become available! We have one more Revenge of the Sith Collectible Cup and Figure to take a look at before we take a short break and post some new stuff. Click below for our Visual Guide of the Yoda set. We also reviewed this figure earlier today. Check that out right here. Let’s look at the Yoda Collectible Figure And Cup set. It is the focus of our Research Droids Reviews today! Be sure to leave your thoughts in our comments section, vote in the poll or even comment about it on our Facebook page. Click the banner below for the direct link to the review! As always, you can also send your review requests via email if you’d like to see something that we didn’t cover yet. ← Shop Disney's Huge End Of Year Sale NOW! Need more Yoda in your life? 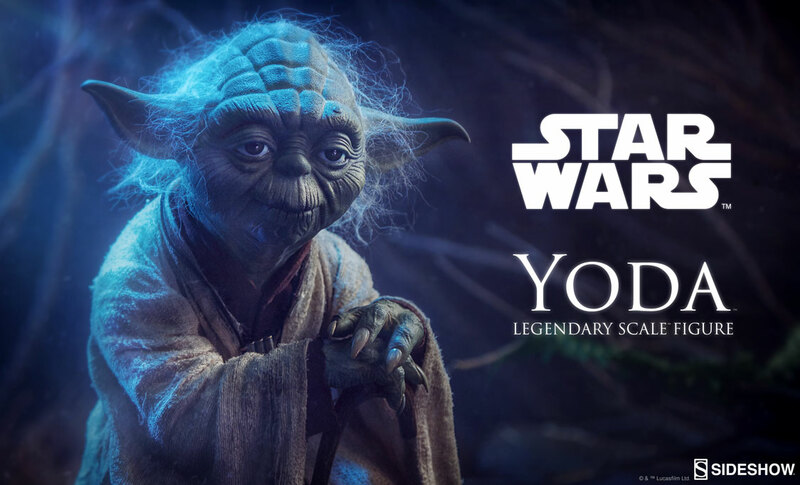 Check out the preview of the Legendary Scale Yoda, part of their 12 Days of Sideshow announcements. ← Rotten Tomatoes Audience Score For The Last Jedi Revealed! NOT GOOD! We’re adding another repacked Mission Series set from the Star Wars Rebels line to our Visual Guides. Click below to check out the Darth Sidious/Yoda (MS04) set. You can also check out a full review of this set right here. We are continuing catching up on filling some holes from the Rebels toy line. Let’s continue with the Darth Sidious/Yoda Mission Series two-pack. It’s the focus of our Research Droids Reviews today! Be sure to leave your thoughts in our comments section, vote in the poll or even comment about it on our Facebook page. Click the banner below for the direct link to the review! As always, you can also send your review requests via email if you’d like to see something that we didn’t cover yet. 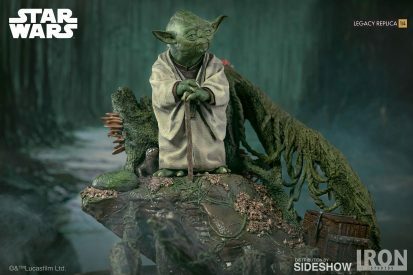 We had the opportunity to review the new Jedi Master Yoda Masterpiece Tabletop Lamp from The Bradford Exchange. Should you pick up this high-end collectible? Check out our thoughts on this unique collectible in our full review! How Much Is That Yoda In The Window? Wow. Apparently just a mistake at the retail level, look what an anonymous JTA reader found at his local Superstore in Canada. That’s the most expensive 5POA figure I have ever seen! ← HASCON Captain Rex Still Showing Up At HTS? Pre-order the Force Link Yoda now for a December 15th ship date. Yoda 12-Inch Figure IN STOCK At Amazon! After many of you saw our Yoda 12-Inch Figure review you were curious to know where to get one. Amazon has just placed it in stock for $9.99! Hurry before they’re gone! Special thanks to JTA reader Craig F. for the alert! If you need some persuasion, check our our Yoda RDR HERE. UPDATE: The new Kylo Ren and Captain Poe Dameron are ALSO in stock! ← Sideshow Collectibles Stormtrooper Life-Size Bust Pre-order! The Star Wars [The Last Jedi] 12-Inch Yoda is our latest addition to the Visual Guide database. Click below to check it out. Make sure to also read our full review right here. The new Yoda 12-Inch Figure is pretty darn nice. Find out why in our Research Droids Reviews today! Be sure to leave your own thoughts in our comments section, vote in the poll or even leave comments about it on our Facebook page. Click the banner below for the direct link to the review! As always, you can also send your own personal review requests via email if you’d like to see something that we didn’t cover yet. We are updating our Star Wars [The Last Jedi] Visual Guide tonight with the addition of the Era of the Force multipack from Target. Click below to look through the full Visual Guide, and click here to check out our review with a complete figure-by-figure breakdown of this set. Another line look means another multipack. Check out the Era Of The Force eight-pack from TARGET. Sigh. It’s the focus of our Research Droids Reviews today! Be sure to leave your own thoughts in our comments section, vote in the poll or even leave comments about it on our Facebook page. Click the banner below for the direct link to the review! As always, you can also send your own personal review requests via email if you’d like to see something that we didn’t cover yet. 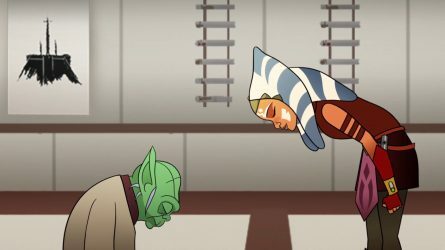 Ahsoka, Yoda, and Anakin return in the latest episode of Forces of Destiny. Click through to watch and discuss Episode 11: Teach You, I Will.